The Netflix science-fiction thriller EXTINCTION follows Peter, a husband and engineer haunted by dreams and flashbacks of war who thinks the visions might have a prophetic meaning. The Netflix science-fiction thriller EXTINCTION follows Peter (Michael Peña), a husband and engineer haunted by dreams and flashbacks of war. Peter’s unsure where the dreams initiated or even if they are even real, but has a hunch that they have some sort of prophetic meaning and that a world war is coming. His wife, Alice (Lizzy Caplan), doesn’t believe him and suspects mental illness so she urges Peter to see a doctor. The dreams begin to take a toll on Peter’s life as he suffers from blackouts, alienates his friends and unwillingly begins to neglect his family. He makes an appointment with the nearby wellness center, but things don’t go as planned. Turns out he wasn’t the only one seeing these nightmares when he’s warned by another patient in the waiting room that the doctors aren’t there to help him but to cover up something much bigger. The nightmares are more than just dreams as they begin to come true. Peter, Alice and their daughters Lucy (Erica Tremblay) and Hanna (Amelia Crouch) are thrust in the middle of a battle between them, and an unknown life source that guns down seemingly everyone who tries to fight back. Lucy and Hanna scream a lot, dumb choices are made by secondary characters, and the outcome seems predictable. Until one of the “aliens” is captured, and [SPOILERS FOLLOW] it’s revealed that not only are Peter and his family not human, the ones that are attacking them are the real humans. Peter, his family, and everyone we thought were human are actually synthetics, created to do work for humans but have somehow overtaken the earth. The nightmares Peter suffered were actually memories from the first war between synths and humans. Now, he and his fellow synths must protect themselves until the humans and synths can live in peace. Ultimately, the plot twist is the only thing that saves this movie from being another mundane “aliens take over the planet” movie. The internal struggle Peter faces in the first 15 minutes are hard to relate as the pace is slow and the ending is seemingly predictable. The alienation between Peter and his loved ones almost seem forced and out of place, making it hard to connect to him and his family. This could be due to Michael Peña’s stagnant and stiff acting compared to Lizzy Caplan’s consistent and emotional performance. They just don’t have the chemistry needed to push the movie forward. What the movie lacks in talent makes up for in simple filming style, a plot twist that is foreshadowed throughout, and a good effort to insert a thought-provoking ending. However, the movie is drenched in violence and terror. This is to be expected of a television movie rated TV-MA, but EXTINCTION is really unnecessarily violent. Interestingly enough, there is not a lot of foul language and almost no profanity. 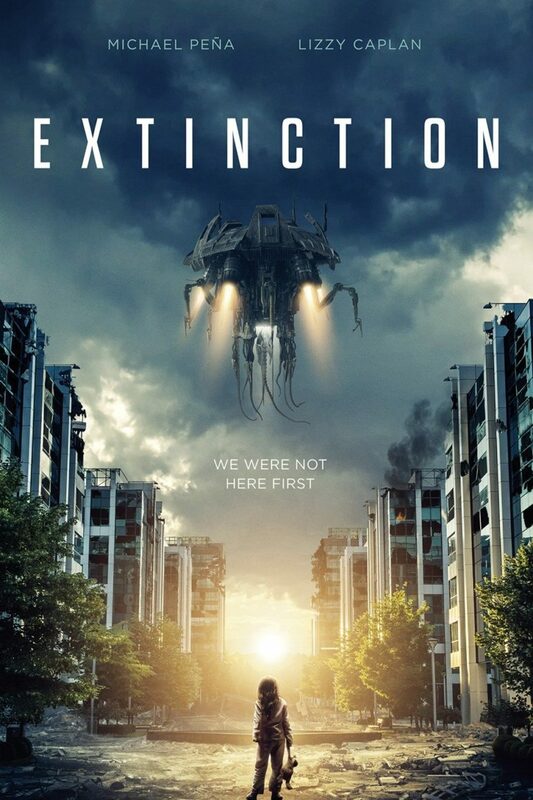 EXTINCTION is not thrilling to watch but instead is a slow paced and violent film, with static connections, bad acting and a waste of a good plot twist. MOVIEGUIDE® advises extreme caution for EXTINCTION. Strong levels of miscellaneous immorality mostly on the children with direct disobedience from the youngest child which puts the family in danger multiple times. The Netflix science-fiction thriller EXTINCTION follows Peter, a husband and engineer haunted by dreams and flashbacks of war. Peter’s unsure of where the dreams initiated, or if they are even real, but has a hunch that they have some sort of prophetic meaning and that a world war is coming. His wife, Alice, doesn’t believe him and suspects mental illness so she urges Peter to see a doctor. The dreams begin to take a toll on Peter’s life as he suffers from blackouts, alienates his friends and begins to neglect his family. Are the dreams a sign of an impending alien attack? Ultimately, a plot twist is the only thing that saves EXTINCTION from being another mundane “aliens take over the planet” movie. However, EXTINCTION is drenched in violence and terror. It also suffers from a slow pace, static connections and mediocre acting. The alienation between Peter and his loved ones seems forced and out of place, making it hard to connect to him and his family. EXTINCTION has no lewd content, but MOVIEGUIDE® advises extreme caution for the violence and scary moments.